MARCOM’s "Bloodborne Pathogens in Heavy Industry" Regulatory Compliance Kit has been specifically created to assist facilities in fulfilling the OSHA Bloodborne Pathogens Standard's (29 CFR Part 1910.1030) training requirements. Bloodborne diseases are a serious concern in the United States. "Hepatitis B" infects over 70,000 people annually, and has over one million "carriers" in the U.S. The HIV virus, which usually leads to AIDS, currently infects over one million people. Because of the increasing problems with these diseases, in 1991 OSHA passed a "Bloodborne Pathogens" regulation. Materials in the kit include a video program, a compliance manual, five motivational posters, and 30 employee booklets. The kit addresses the major areas needed to comply with the Standard. A compliance manual containing a "fill-in-the-blank" Exposure Control Program, as well as other materials needed to help meet compliance requirements, is included. The posters in the kit emphasize the importance of preventative measures. 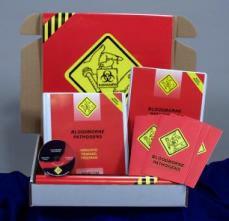 The videotape and employee booklets include information on the contents of the standard, epidemiology and symptoms of bloodborne diseases, modes by which bloodborne disease is transmitted, the exposure control plan, recognition of exposure situations, practices to prevent exposure, HBV vaccination, emergency procedures, signs and labels, selection and use of personal protective equipment, and more. The video program in the kit comes with a comprehensive leader's guide, reproducible scheduling & attendance form, employee quiz, training certificate and training log.